Horsepower is a relative number. Compared to the 1,500 hp in the last AMS car we drove, the face-melting Alpha 12 GT-R, 900 seems pretty tame. But by any rational standard that's a crazy amount of power, the kind that's hard to grasp in practical terms. When AMS Performance called us and offered a test in the 921-hp Alpha 10 Audi R8, saying yes was easy. Figuring out how to demonstrate that much thrust was the tricky part. Our solution was to head to the drag strip. What better way to show off the wicked alterations wrought by AMS president Martin Musial and his team than a video showing the car do the Star Trek warp speed effect through the quarter mile? AMS has a history of building quick drag strip cars, like the aforementioned GT-R and a series of Mitsubishi Lancer Evolutions. Vice president Arne Toman even owns the world's fastest Hearse. We should have taken the broken scoreboard at Milan Dragway as an omen. Wiped out by a lightning strike, both displays have since been replaced. Before our test both Musial and Toman explained that the Alpha 10 R8 wasn't built with drag racing in mind. But, being good sports, both met us at the track in southeast Michigan, unloaded the R8 from its trailer, and let us run through the timing lights over and over. The best time that day was 11.0 seconds at 136 mph, uncorrected. One of the many amazing things about the Alpha 10 Audi R8 is that it's essentially a bolt-on system. That's fast, but not what you'd expect for 786 horsepower at the wheels. And, honestly, we're not disappointed. First, a 4,200-rpm rev limiter was set too low to launch on the sticky drag strip. Put another way, that drag strip time is almost a street start. For what it's worth, Musial and Toman didn't seem concerned about the numbers. Like we said, they present the Alpha 10 as an all-around performance car, and we believe them. Now, if you go to AMS with the drag strip in mind, Musial and his staff can program whatever launch rpm you desire. (You're on your own for clutch replacements.) A reflash of the engine controller is part of the Alpha 10 package. Drop off a stock R8 V10 at AMS (or any of its 70-plus dealers), and they'll pull out the suitcase-shaped muffler that sits behind the engine. A pair of turbochargers, small mufflers, and two heat exchangers attach to the stock exhaust system mounts, while a giant water-to-air intercooler sits on top of the engine. The rest of the engine remains untouched, with the exception of new MAF sensor housings. Musial explains that during development of this Alpha 10, the stock sensors would max out. He kept the sensors, but recalibrated them and built larger enclosures to allow for more airflow. One of the many amazing things about the Alpha 10 Audi R8 is that it's essentially a bolt-on system. "We basically take it to the safe limit of the stock clutch, engine, and transmission," says Toman. And, relative to the $99,000 rebuild of the Alpha 12 GT-R, the Audi is a bargain. $39,000 gets you all the parts. According to Toman the total installed price is about $45,000. Figure anywhere from $100,000 for used to north of $200,000 new for the donor car, and AMS almost doubles the power for a fraction of the total cost. Driving this car on the street recalibrates the idea of fast, even relative to a Hellcat or a Z06. AMS doesn't touch the R8's brakes or suspension, which is just fine. The R8 is already one of our favorite cars to drive, and stock brakes provide plenty of stopping power. Of course, with the Alpha 10 treatment you use a lot more of the brakes than in a stock R8. Musial likes to say that with the big-displacement engine there's no turbo lag, but that's not entirely accurate. It's more that before the turbos come on line the R8 is already quick. Once the boost kicks in, though, the revs climb at an exponential rate. Driving this car on the street recalibrates the idea of fast, even relative to a Hellcat or a Z06. Get on the power in the Alpha 10 R8 and your brain skips a beat. You go from "I'm going to hit the gas," straight to "Holy crap that stoplight is coming up quick," with barely any recollection of what happened in between. And all the while you can hear the turbos whoosing and wastegate popping right behind your ears like the devil on your shoulder, prodding you to hit triple-digit highway speeds. This car has a serious amount of power. The kind that can get you into trouble, both legal and physical, all too easy. The kind that needs to be taken seriously. And yet you'd barely realize it from driving the Alpha 10 R8. 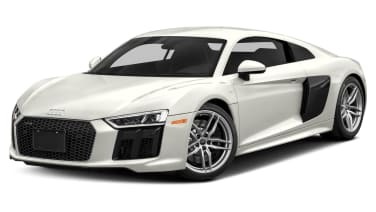 It looks almost like a stock R8, and it drives almost like a stock R8. All that extra power integrates smoothly into the powerband. There's no unexpected threshold that suddenly spins the tires, no bucking as you get on or off the throttle. The Alpha 10 Audi R8 is deceptive in its ease. After a day driving around town, 900 horsepower feels totally normal. Heck, we'd even describe it as practical.